Wilder (39-0, 38 KO’s) knocked Stiverne (25-3-1, 21 KOs) to the ground three times before referee Arthur Mercante halted the bout at 2:59 of the opening round. After Stiverne took Wilder the distance in their January 2015 title bout, Wilder has now knocked out every single opponent that he has faced in his career. Watch Wilder knocking out Stiverne HERE. 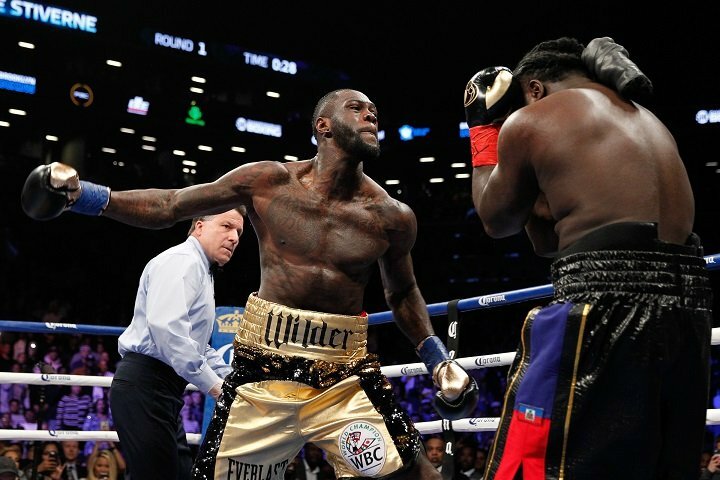 Wilder first knocked Stiverne to the ground with a devastating one-two combination that caught the Haitian challenger on the nose. Seconds after Stiverne got back to his feet, Wilder landed another clean combination with a big left and an overhand right that sent a stunned Stiverne back to the canvas. The final blow came in the waning moments of the opening round as Wilder landed four clean punches to the face of a wobbly Stiverne. After the brutal knockout, an emotional Wilder was asked by SHOWTIME Sports® reporter Jim Gray about a possible fight with unified heavyweight champion Anthony Joshua. “I’ve been waiting on that fight for a long time now,” said Wilder. “I declare war upon you. Do you accept my challenge? I’ve been waiting for a long time. I know I’m the champion. I know I’m the best. Are you up for the test?